Adventures in the Endless Pursuit of Entertainment: Listening Pleasure! There's good news for listening pleasure today! 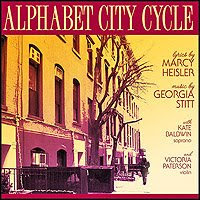 The song cycle "Alphabet City Cycle" by composer Georgia Stitt and lyricist Marcy Heisler is digitally released today by PS Classics on iTunes. "Alphabet City Cycle", based on a series of related poems by Marcy Heisler, features Kate Baldwin accompanied by Georgia Stitt on piano and Victoria Paterson on violin. Other good news is that Christine Ebersole is recording the Noël Coward songs heard during the scene changes of Blithe Spirit. "Christine Ebersole Sings Noël Coward" will be fast-tracked so it can be sold in the lobby of the Shubert Theatre, where Blithe Spirit plays until at least July. If you've been to Blithe Spirit, you know these tunes are merely the icing on the cake of this delightful production. The only thing that would make this news better is if Christine would throw in a tune or two from High Spirits, the musical version of Blithe Spirit. "Christine Ebersole is recording the Noël Coward songs heard during the scene changes of Blithe Spirit." Yay!!! As you said, icing on the cake.